I check my email countless times every day and every time that ‘send and receive’ kicks in I know there will be at least two emails selling a forex robot. I know I have been over this many times before but I think as these forex robots get so much attention and there are so many “traders” selling them there needs to be articles that balance them out somewhat. Hopefully these articles will be slowly but surely get seen by others and that they will be forced to think about what they could be buying a little more closely. This was in one of those emails this evening. What stood out to me was that the best trade in pips was 7pips but by value it was over $400. In fact it works out at £57.6 per pip. The worst lost was an okay 72pips but that only cost $172.80…an average of $2.4 per pip. So what that says to me is the system starts out will a low stake of £2-3 per pip but if it goes against you and not hit a target somewhere between 0-7 pips then you add and add again until it does. Think of it this way if you were trading at $20-30 a pip initially….you would be up to $576. 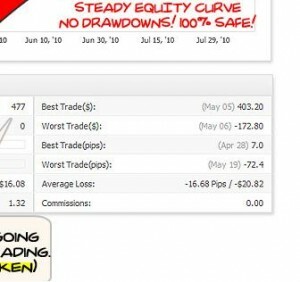 So a 10 pip drawdown from that final “add” would be a loss on account of $5760!!!!! When you take those numbers into account the average loss seems very odd. Only $20…that would imply 10pip or less stops but it says 16pips. Why would a system that has an average loss of 16 pips have a 72 pip loss of £172 on its books. Doesn’t seem right does it? Looking at it another way..you would need 49 trades at -$17 loss and 1 at that -$172 to make an average of $20 loss. Why would a system that can stop you out for $-17 98% of the time need to take $172 loss 2% of the time??? It just doesn’t make sense. If someone could explain it to me I would be a happy man. And it says in plain writing “no drawdowns”. Yeah Right!!! I am an active trader for 15 years now. I am always sceptical when it comes to new trading systems. I have seen many trading systems and I have tried to come up with systems myself. Just have to keep pluging away at it. Now that’s something worth reading. Thanks for sharing it with us!